On March 28, 2008, the U.S. Department of Energy (DOE) announced that it will make available up to $2.4 million to 12 U.S. cities to advance solar energy. Secretary Samuel W. Bodman announced the 2008 Solar America Cities on March 28th while delivering keynote remarks at the New Frontiers in Energy Summit 2008 in Denver, Colorado. Solar America Cities are chosen for their commitment and comprehensive approach to overcoming barriers to and developing infrastructure that supports increased deployment of solar technologies in their municipalities. The cities' solar projects further President Bush's Solar America Initiative (SAI), which aims to make solar electricity from photovoltaics cost-competitive with conventional forms of electricity from the utility grid by 2015. In addition to funding, DOE provides hands-on assistance from technical experts to help Solar America Cities integrate solar technologies into city facilities and energy planning. Experts are available to assist Solar America Cities in streamlining local regulations and practices (e.g., zoning and building codes) that affect the adoption of solar technologies by residents and businesses. They can also help the cities develop solar financing options and incentive programs as well promote solar technology among residents and local businesses through outreach and curriculum development. For more information, visit the DOE press release. GridPoint Inc., a leading clean tech company whose smart grid platform benefits electric utilities, consumers and the environment, announced the appointment of new members to its board of advisors, including energy technology pioneer Robert N. Danziger, Chairman of the Midwest ISO Paul J. Feldman, former Deputy Secretary of Energy T.J. Glauthier, former CIA Director R. James Woolsey, and CERA Chairman and Pulitzer Prize winner Daniel Yergin. GridPoint also announced a strategic investment of $15 million by the Quercus Trust, a prominent investor in alternative energy companies. Since the company's inception in November 2003, GridPoint has raised $102 million in equity capital. GridPoint was selected by the World Economic Forum as a Technology Pioneer 2008 and participated in its annual meeting in Davos, Switzerland. "We are honored to welcome advisors of such high caliber," said Peter L. Corsell, President and CEO, GridPoint. "Their insight and counsel will be invaluable as we work to transform the current electric power grid into an intelligent network that drives energy efficiency and accelerates the adoption of renewable energy sources." Danziger is founder and served as Chairman and CEO of Sunlaw Energy Corporation (1980-2005), an independent energy producer and technology developer that set benchmarks for reliability, profitability and emissions levels. He also co-founded Emerachem, a leading producer of air pollution control catalysts. Danziger worked as a policy analyst, project manager and consultant at California Institute of Technology's Jet Propulsion Laboratory, focusing on technologies for energy independence and a clean environment including the hybrid car, photovoltaics and alternative fuels. Since 2004 he has lectured at Stanford University on climate change, biofuels, oceanic pollution and emerging solutions, and oil price forecasting. Danziger was an advisor to Google's ReChargeIt electric and hybrid vehicle program and continues to investigate greenhouse gas mitigation strategies that are commercially sustainable. Feldman is Chairman of the Midwest ISO (Independent Transmission System Operator), which manages energy in 15 Midwestern states and a portion of Canada. After a 20-year career with AT&T, he served as CEO of two large energy companies, founded and sold three new ventures in the energy and technology sector, and assisted Novell in a business turnaround assignment. He currently serves as Chairman of business intelligence firm TrendIQ and CEO of China Energy Partners, a special purpose acquisition corporation focused on energy in China. He recently was appointed by the U.S. Secretary of Energy to the National Coal Council. Feldman also sits on several advisory boards of firms involved in energy and technology and is an active angel investor and entrepreneur in the Northern Virginia technology community. Glauthier served from 1999 to 2001 as Deputy Secretary and COO at the U.S. Department of Energy, where he directed management and policy development. Prior to that, he spent five years at the White House as Associate Director of the Office of Management and Budget. He is former President and CEO of the Electricity Innovation Institute, an affiliate of the Electric Power Research Institute (EPRI), and under his leadership it initiated programs that included modernizing the electricity grid, clean energy resources, advanced coal technologies, and critical infrastructure security. Glauthier also is an advisor to organizations in the energy and clean tech sectors through his firm, TJG Energy Associates, LLC, and through association with Booz Allen Hamilton's global energy practice. Woolsey has served the U.S. government on five different occasions, most recently as Director of Central Intelligence; he has held Presidential appointments in two Democratic and two Republican administrations. Currently, as a venture partner at VantagePoint Venture Partners of San Bruno, California, he concentrates on clean tech investments, especially renewable energy and energy security. He also is Chairman of the Strategic Advisory Group of Paladin Capital Group, a Senior Executive Advisor to Booz Allen Hamilton, and Of Counsel to Goodwin Procter, having previously practiced law for 22 years with Shea & Gardner of Washington, D.C. He is Chairman of the advisory boards of the Clean Fuels Foundation and the New Uses Council and serves on the National Commission on Energy Policy. In 2003, when he was a Vice President of Booz Allen, Woolsey was named by Consulting magazine to its list of Top 25 Consultants in the U.S.
A highly respected authority on energy, economics and international politics, Yergin plays a leadership role in the global energy industry. He is Chairman of Cambridge Energy Research Associates (CERA) and Executive Vice President of IHS. He received the Pulitzer Prize for General Nonfiction for the national bestseller The Prize: The Epic Quest for Oil, Money and Power and the United States Energy Award for lifelong achievements. Yergin chaired the U.S. Department of Energy's Task Force on Strategic Energy Research and Development. He is a member of the U.S. National Petroleum Council and was vice chair of its new Facing the Hard Truths about Energy study. He is also a board member of the U.S. Energy Association and the U.S.-Russian Business Council. GridPoint's board of advisors also includes former U.S. Senator Bill Bradley, renowned futurist Esther Dyson, internationally recognized energy and environmental leader David J. Jhirad, and former EPA official and former Alliance to Save Energy President William A. Nitze. GridPoint is the pioneer of an innovative smart grid platform that aligns the interests of electric utilities, consumers and the environment. The platform applies information technology to the electric grid to provide utilities with an intelligent network of distributed resources (e.g., advanced load control devices, batteries, solar systems) that reside at the point of consumption – the home or business. Additionally, the platform's modular, scaleable and upgradeable architecture enables utilities to create a practical path for integrating new clean technologies (e.g., plug-in hybrid electric vehicles and fuel cells). During peak demand periods, the platform enables utilities to efficiently balance supply and demand by discharging stored power or reducing loads with minimal impact on customers (i.e., controlling temperature versus shutting down air conditioners). Utilities can also optimize existing baseload generation assets and relieve stress on transmission and distribution (T&D) lines. The platform serves as a virtual peaking power plant, enabling utilities to avoid the regulatory, environmental and "time-to-build" hurdles associated with building centralized plants while fueling the mass adoption of renewable energy, reducing carbon emissions and conserving fuel, capital and land resources. For consumers, GridPoint's platform provides protection from power outages, increases energy efficiency through online energy management and integrates utility-controlled renewable energy systems, paving the way for the commercial success of residential and light commercial solar and wind energy sources. GridPoint's recent recognition includes being named overall winner by AlwaysOn GoingGreen 100 Top Private Companies 2007, one of the Red Herring 100 Global, as well as winner of the 2007 North American Frost & Sullivan Award for Green Excellence for its success in pioneering a way to harness load management and distributed generation to achieve environmental sustainability. GridPoint is featured in the new book Earth: The Sequel, a business-centric approach to alleviating climate change by Fred Krupp, President of the Environmental Defense Fund, as well as in the Smart Grid chapter of The Clean Tech Revolution by Ron Pernick and Clint Wilder. A new solar energy start-up called 1366 Technologies has just received $12.4 million in venture capital to help foster and enhance a solar technology created by MIT professor Emanuel Sachs. The financing round for 1366 Technologies was co-led by North Bridge Venture Partners and Polaris Venture Partners. Sachs invented string ribbon solar manufacturing, which is a new way to produce and maintain solar energy cells. It makes the alternative energy source more accessible and affordable. The technology was seen as a crucial step in solar energy, and an entire company was created around in in December 2007. Since then, the main setback has been a lack of funds. With oil prices over US$100/barrel, China’s independent refineries are understandably balking at supplying at a loss. The government is forcing independent suppliers to take the brunt of the massive inflation affecting the country, causing shortages to even Shanghai and Beijing. With the science of climate change pretty solidly unimpeachable at this point, the rag tag camp of climate change deniers, detractors, doomsayers and other flat-earthers have a new tactic these days: talk up the supposedly disastrous economic consequences of regulating carbon. A good example: the National Association of Manufacturers has been peddling a bought-and-paid-for "study" of the Lieberman-Warner climate change bill, taking their doom-and-gloom predictions of an economy wrecked by climate regulations on a national speaking tour over the next couple of months. The Flat Earth camp pulled out all the stops at the Wall Street Journal's ECO:nomics conference held last week in California. Hosted by "climate change experts" from the WSJ's notoriously ideological, knuckle-dragging, anti-climate editorial board, the WSJ assembled the full cast-of-characters of the Flat Earth Society of America: Fred Smith and Myron Ebell of CEI (makers of the hilariously funny "CO2: some call it pollution, we call it life" ad), Steve Milloy of JunkScience, and the WSJ's own ideologues came into the conference to put America's leading "green-minded" CEO's to the test, show them they were simply tools for liberal, socialist hippies, and expose carbon regulation as the sure-fire end of the treasured American way of life. "Instead, they ended up looking small, shrill, and utterly marginalized," David Roberts, who covered the Eco:nomics conference for Grist.org writes. "Despite their claims to be pro-business, the business community disdains them." Or how about this video of WSJ's Alan Murray trying to bait WalMart's CEO, H. Lee Scott Jr. into objecting to carbon regulation because it will raise energy prices and kill the economy. Scott just won't buy it! Well at least they'll always find open arms and a welcome home at James Inhofe's office. Gristmill: "Eco:nomics: The decline and fall of the ideologues"
Energy Smart: "WSJ, the anti-business newspaper of record?" SolveClimate: "Wall Street Journal Editorial Page Laughing Stock -- Of It's Own Conference"
WarmingLaw: "CEI's Ideas Can No Longer Compete (Outside of Congress and the EPA)"
Wind Energy---How Does It Fit Into Our Future? I saw a posting on Facebook this week that asked, “Is wind energy for real? I have been told that it is just hype”. My thoughts were that if you lived in the Southwest you would witness daily the progress of wind energy. We in the Southeast and Northeast see occasional wind generators and do not relate to the future of wind energy. If we visited the European countries, especially Germany, we would see a major growth in wind energy generation. The progression of harvesting energy from moving air can no longer be thought of as tilting at windmills. Wind energy will be a major player in the replacement of fossil fuels. The key reason for the acceptance of wind energy is its dropping cost for electrical energy. Over the past three decades, the cost of a watt of electricity generated by wind has dropped to equal the cost of fossil fuel. During the 1970s, turbine blades were 32 feet long and wind power cost $2.00 per kilowatt (kW-hr). Today, wind turbines with blades 130 feet long have cut the cost to around .05 cents per kW-hr. with federal subsidies to build the installation. In the future, the cost of wind energy will continue to decease while fossil fuels will continue to increase. As noted above, the larger blades are more efficient in producing electricity. 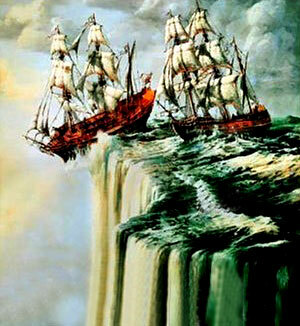 This is because more wind is caught by a blade with a larger surface area. A town of 8,000 needed 40 turbines to meet its power needs in the mid-1990s, while just one larger model is needed today to produce the same amount of energy. There is a great deal of ongoing research around the world to continue to improve the efficiency of the wind turbine. On the drawing boards are turbines with blades almost 300 feet across. This size blade will drive the cost of wind energy down to less than fossil fuel generation. To take advantage of the larger blade, Energy Unlimited in West Conshohocken, Pennsylvania has patented the variable length blade or blade with a blade. This innovation extends or contracts depending on wind conditions. 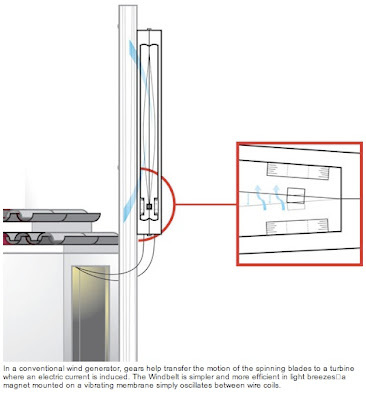 A controller in the base of the tower responds to changes in wind speed, extending the inside blade in lighter winds and retracting it in heavier winds. Conventional turbines have to be shut off when the wind is too strong. The variable blade is claimed to be 25% more efficient and is operating as a prototype since 2002 near Palm Springs, California. For those who are technically curious, there is a lot more research occurring in universities and research laboratories on the components of the turbine, the shapes of blades and predictions of the winds. This research will continue to improve the wind turbine efficiency and further reduce the cost of wind energy. By almost any measure, wind generated energy is exploding. The growth is primarily limited by turbine availability as the higher efficiency turbines are introduced. The global wind-power industry has grown from $11.8 billion in 2005 to $17.9 billion in 2006. Clean Edge Research projects the market will triple to $60.8 billion by 2016. In the United States in 2006 wind was the second-largest source of new generating capacity, trailing only natural gas. More than 2.4 GW of new capacity was installed, a 27% increase that brought total U.S. wind generating capacity to 11.6 GW, enough to power about 2.9 million homes , according to the American Energy Association. Over the past 20 years, a strong DOE-funded R&D effort combined with private partnerships has lowered the base cost of wind energy from around 80 cents/kWh to as low as 4 cents/kWh. When combined with the government tax incentives which provide an incentive of 1.9 cents/kWh for the first 10 years of a project, and other tax considerations, the cost of wind energy becomes very competitive, and is sometimes lower than conventional generation sources. In Canada the wind generating capacity nearly doubled in 2006, .adding 657 new MW for a total of more than 1.3 GW. The Canadian Wind Energy Association's goal is for 10,000 MW of installed wind energy in Canada by the year 2010, enough to supply 5% of Canada's electricity needs. Denmark currently generates over 20% of its power from the wind, an attainable goal for Canada. If wind energy were to generate 20% of Canada's electricity, it would be the second largest source of electricity behind hydro and ahead of nuclear, natural gas and coal. European countries are leading U.S. and Canada in the adoption of wind energy. The total capacity of new wind turbines brought on line across the European Union last year was 8,554 MW, an increase of 935 MW on the 2006 total. Total wind power capacity installed by the end of 2007 will avoid about 90 million tones of CO2 annually and produce 119 Terawatt hours in an average wind year, equal to 3.7% of EU power demand. In 2000, less than 0.9% of EU electricity demand was met by wind power. The European countries have resolved that wind energy will be 20% of their generating capacity by 2020. The Asian nations are also quickly adopting wind energy. India added 1.8GW of wind energy in 2006. Suzlon Energy, based in Pune, is the world most consistently profitable wind turbine maker. Meanwhile, China, which had installed capacity of 2.6 GW in 2006, plans to install more than 30 GW, enough to power 30 million average Chinese homes by 2020. People do not like the sight or the sounds of windmills in their backyards. This seems especially true for ocean views. This is a major hurdle to conquer. It may be that the wind energy generating platform needs to go further out which brings energy transmission problems. This concern is becoming less each day. A few studies to date have shown that the location of the wind turbine(s) is the major problem. Those turbines in migration paths cause the most problems. Thus the location of future turbines recognizes the concern for birds and bats. Also, different colors for the blades and warning noises are being studied to remove this hazard. These days, conventional thinking about wind turbines is "bigger is better." Since power output scales exponentially with rotor diameter, wind turbines are getting bigger and bigger in order to squeeze more clean energy out of the rushing wind. The Enercon E-126 is now the world's largest wind turbine. It's mammoth 126 meter (413 ft) rotor generates over 7 megawatts of electricity enough to power 1,775 average American homes. Enter the tiny but innovative "windbelt." Looking like some kind of pygmy David next to the towering Goliaths of modern, utility-scale wind turbines, the windbelt, an invention of 28-year-old Shawn Frayne, bucks any conventional thinking about wind turbine design. Instead, Frayne designed his invention to be low-cost, highly efficient, source of power at the milliwatt scale, not the megawatt scale. Frayne invented the wind belt after working in Haiti and designed the tiny wind generator to produce enough, cheap power to run LED lights and radios in the homes of the world's poor. Frayne says. So he took a new tack, studying the way vibrations caused by the wind led to the collapse in 1940 of Washington's Tacoma Narrows Bridge (aka Galloping Gertie). Frayne's windbelt, which won Popular Mechanic's 2007 Breakthrough award for innovative designs, consists of a taut membrane fitted with a pair of magnets that oscillate between metal coils to produce electricity. Prototypes have generated 40 milliwatts in 10-mph slivers of wind, making his device 10 to 30 times as efficient as the best microturbines. Frayne envisions the Windbelt costing a few dollars and replacing kerosene lamps in Haitian homes. "Kerosene is smoky and it's a fire hazard,"
says Peter Haas, founder of the Appropriate Infrastructure Development Group, which helps people in developing countries to get environmentally sound access to clean water, sanitation and energy. "If Shawn's innovation breaks, locals can fix it. If a solar panel breaks, the family is out a panel. Frayne hopes to help fund third-world distribution of his Windbelt with revenue from first-world applications. The windbelt could replace the batteries used to power temperature and humidity sensors in buildings, for example. So here's to thinking big and designing small. We need innovative, clean energy solutions at all scales, and for deployment throughout the world, including the developing world. "There's not a huge amount of innovation being done for people making $2 to $4 per day,"
says Haas. "Shawn's work is definitely needed. 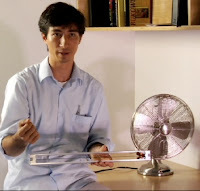 Frayne explains his invention at a video at Popular Mechanics. Ed Markey and Henry Waxman are no Fossil Fools! The two Chairmen and Congressional Climate Champs released a new bill yesterday calling for a moratorium on any new coal plants that do not capture and sequester their greenhouse gas emissions. The ban would stay in place until Congress adopts and implements comprehensive global warming regulation and is designed to addresses the largest new source of global warming pollution — new coal-fired power plants that are being built without any controls on their global warming emissions. "Comprehensive economy-wide regulation to address global warming is coming soon. But new uncontrolled coal-fired power plants are being built today," said Rep. Waxman (D-Cal. ), chair of the House Oversight and Government Reform Committee, and author of the most-aggressive Congressional proposal to regulate greenhouse gases. “My legislation says: “No new plants without emissions controls.” The alternative is senseless - locking in decades of additional global warming emissions and requiring greater emissions reductions across the U.S. economy to compensate." "If we lose control of coal, we will have lost control of the climate," said Markey (D-Mass. ), Chairman of the House Select Committee on Energy Independence and Global Warming. "This bill will make companies prepare for the future and prevent them from building low-tech coal-fired power plants before a global warming bill is passed that will necessitate the use of the newest, most climate-friendly technology. " Without emissions controls, a new coal-fired power plant will emit hundreds of millions of tons of global warming pollution over its fifty-year lifetime. Over 100 new plants have been proposed, and if just a portion of these are built, they will make hitting greenhouse gas reduction targets necessary to halt dangerous climate change next to impossible. A single new uncontrolled coal plant could erase all the emissions reductions that will be achieved through the Northeastern states' Regional Greenhouse Gas Initiative, for example. The bill, titled the "Moratorium on Uncontrolled Power Plants Act" would ban either EPA or states from issuing permits to new coal-fired power plants that are not built with state-of-the-art emissions control technology to capture and permanently sequester the plant's carbon dioxide emissions. The moratorium extends until a comprehensive federal regulatory program for global warming pollution is in place. Looking ahead to future global warming regulations, the bill also bars any new coal-fired power plant built without state-of-the-art control technology from receiving any free or reduced cost emissions allowances under a future cap-and-trade program for greenhouse gases. "Many communities are still paying for failed nuclear power plant investments in the 1980's," said a press release issued by Chairman Markey. "This bill puts investors and power companies on notice that if they invest in new sources of global warming pollution now, taxpayers won't pay for the costs of cleaning up those sources later." “It’s important for ratepayers and regulators to understand the financial risks if their power company wants to build a new uncontrolled coal-fired power plant," said Rep. Waxman. "Those plants will be a lot more expensive to operate when global warming pollution is regulated. Ratepayers need to make sure they won't be stuck with the bill." It's time to simply say "No!" to new coal plants! Like Markey and Waxman, American's are no Fossil Fools. Americans want Green Jobs Not Coal, and it's time Congress heard that message. Once again we in the USA have been chided by President Bush for being addicted to foreign oil. President Bush was speaking to the March 5, 2008 Washington International Renewable Conference, a meeting of global energy officials. He told the attendees, “we gotta get off oil, America has got to change its habits.” He went on to say, "It should be obvious to all, demand has outstripped supply, which makes prices go up." He is right; we are addicted to oil. We complain about the gasoline and electrical prices, while eighty five percent of us believe that global warming is real and caused by humans. We have not broken the chains of driving our cars or heating our homes in energy inefficient ways. This is mainly because we are not offered affordable alternative energies to break these addictions. The major bet of President Bush is on ethanol, but we are now seeing escalating food prices as our corn goes to fuel production, and now it is projected to be as contaminating as gasoline. Its saving grace is that it keeps our dollars in the USA. President Bush can hardly take credit for promoting renewable energies when he has held up incentives like production tax credits and refuses to cap carbon dioxide emissions. President Bush reiterated his call for a global cap on carbon dioxide, the main gas behind global warming, but said the United States should not act until nations like China and India do as well. It is actions like these that make one wonder if we will ever break the chains of addiction. We are currently a second-tier player in the adoption of alternate energies, and we need government incentives to move us to the top tier. We will have a new administration in January 2009 that will, hopefully, be more supportive of alternative energies. It is a good bet that their first moves will be a “cap and tax” bill but should include incentives to help the solar, wind and geothermal industries. It will take time for the alternate energies to gain traction. This means that we will be dependent on coal as an electrical generation fuel for much longer than we would like. We will need to stop or reduce carbon dioxide pollution if we are to use coal for a longer period when oil becomes more scarce and out of affordable reach. This brings us to the questions of the readiness of the highly touted Carbon Capture and Storage (CCS) technology. The premise sounds great to enable and maintain a quality of life that we are used to and desire. An overview of the CCS technology is quite simple. The carbon dioxide is captured from the fossil fuels before burning or in the smokestack. The CO2 is conveyed by pipes or perhaps converted to a solid at the generation site. The captured gas is then compressed and buried in a reservoir to preclude its escape into the atmosphere. Post Combustions Capture: The effluent gases from a fossil fuel generating plant can be scrubbed to remove the CO2 and captured for transport to the intended reservoir. Pre-Combustion Capture: The fossil fuel is partially oxidized before combustion. The resulting CO2 can be captured in a relatively pure exhaust stream. Oxy-Field Combustion:The fuel is burned in oxygen instead of air. To limit the resulting flame temperatures to levels common during conventional combustion, cooled flue gas is recalculated and injected into the combustion chamber. The flue gas consists of mainly carbon dioxide and water vapor, the latter of which is condensed through cooling. The result is an almost pure carbon dioxide stream that can be transported to the sequestration site and stored. These capture technologies are well understood and examples of their use can be pointed out today. The cost of these techniques, however, will be high. There will be additional capital costs to install the technology. Depending on the capture technology, the energy cost to power the capture techniques can add 10 to 40% additional energy costs. The cost of the energy could be two times what we know today. This technology is, very simply, pipes which will convey the CO2 gas from the generation plant to the reservoir for storage. Here we have an abundance of proposals, but none have been proven on a large-scale demonstration. The proposals range from caverns in the earth to the ocean. The proposal is to compress the CO2 gas and then store it as a gas or react it into a carboneous mineral such as limestone for storage. It is estimated that this procedure will add another 30 to 40% onto the cost of energy in addition to the capture of the gas. There are several CO2 storage projects in operation. Sleeper is the oldest project (1996) and is located in the North Sea where Norway's StatoilHydro strips carbon dioxide from natural gas with amine solvents and disposes of this carbon dioxide in a deep saline aquifer. Since 1996, Sleipner has stored about one million tons of CO2 a year. A second project in the Snohvit gas field stores 700,000 tons per year. The Weyburn project is currently the world's largest carbon capture and storage project. Started in 2000, Weyburn is located on an oil reservoir discovered in 1954 in Southeastern Canada. The CO2 for this project is captured at the Great Plains Coal Gasification plant in Beulah, North Dakota, which has produced methane from coal for more than 30 years. The first phase finished in 2004 and demonstrated that CO2 can be stored underground at the site safely and indefinitely. A major Canadian initiative called the Integrated CO2 Network (ICO2N) is a proposed system for the capture, transport and storage of carbon dioxide (CO2). ICO2N is an alliance of 15 largest Canadian industrial companies and the Canadian Government. The Alliance has been in existence for two years. The ICO2N alliance has the stated objective to be the “world Leader in the implementation of Carbon Dioxide Capture and Storage.” Its goal is to remove 60% of Alberta CO2 emissions and also to enhance oil recovery from mature oil fields. The first phase of operation is planned in 2012-2015. In October 2007, the Bureau of Economic Geology at The University of Texas at Austin received a 10-year, $38 million subcontract to conduct the first intensively monitored, long-term project in the United States studying the feasibility of injecting a large volume of CO2 for underground storage. The project is a research program of the Southeast Regional Carbon Sequestration Partnership (SECARB), funded by the National Energy Technology Laboratory of the U.S. Department of Energy (DOE). The SECARB partnership will demonstrate CO2 injection rate and storage capacity in the Tuscaloosa-Woodbine geologic system that stretches from Texas to Florida. The region has the potential to store more than 200 billion tons] of CO2. Physical work started in late 2007. FutureGen was a US government project announced by President Bush in 2003 to build a near zero-emissions coal-fueled power plant to produce hydrogen and electricity while using carbon capture and storage. In December 2007, Mattoon Township, Coles County, Illinois was chosen as the site for the plant from among four finalists in Illinois and Texas. Sadly, on January 29, 2008the Department of Energy announced it was withdrawing funding from FutureGen, effectively terminating the project. The Department of Energy has stated that the demonstration was canceled because costs had escalated to $1.5 Billion and it did not believe a demonstration of the technology was now needed. The DOE has asked for existing power plants to submit proposals to be fitted for CCS to be up and running in the 2015-2016 timeframe. The capture of carbon dioxide is the most expensive component of the technology and is receiving the focus of the world researchers. UCLA’s researcher, Omar Yaghti, has developed ZIF materials which can absorb 80 times their weight in carbon dioxide. After absorption, the material can be decompressed and the CO2 released. Research at the University of Texas in Austin, led by Professor Gary Rochelle, has developed a chemical process that will absorb carbon dioxide and release it when boiling the mixture. There are many other examples of these new technologies in research to capture carbon dioxide and for sure many others to be demonstrated. Carbon Dioxide Capture and Storage is a well demonstrated technology that is ready for large scale implementation. The cost of scrubbing exhaust gases or the pre burned fuel and the CO2 Gs compression will raise the energy costs between 40 to 60% over the unscrubbed and storged CO2 technology. There are scores of researchers working to develop materials that can absorb the CO2 gas in the smokestack and avoid the energy cost of scrubbing. These developments are at a minimum of seven to ten years away. We had best encourage this development, because it will be 10 to 15 years before their implementation after they are begun. A hat tip to BruceMcF for calling my attention to this.. Both Barak Obama and Hillary Clinton have solid energy plans that, if implemented, would take America into a cleaner energy future. On energy and climate, like on so many other issues, both remaining Democratic contenders for the White House followed John Edwards' early example and developed bold clean energy and climate change plans late last year. As David Roberts of Grist says, "Both would substantially cut greenhouse gas emissions and boost clean energy; both pitch sustainability as an issue of shared sacrifice and economic opportunity; both have an impressive grasp of the policy details." In fact, when it comes to the two candidates' energy and climate plans, there's about as much distance between them as their current neck-and-neck delegate counts. Obama and Clinton have something else in common we should all be taking note of: they've both been talking up so-called "clean" coal on the campaign trail, especially in coal-friendly primary states like Ohio and Wyoming. Obama earned some well-deserved heat last summer for his seemingly friendly stance towards coal-to-liquids (CTL) synthetic fuel production. While CTL might help displace oil, the synthetic fuel results in up to twice as much greenhouse gas emissions as conventional gasoline. Obama has since "clarified" his position on CTL, saying he'll only support new plants if they decrease both oil use and GHG emissions (a tall order for this dirty fuel!). Clinton has been pretty silent on CTL, but both candidates energy plans and stump speeches tout the potential of "clean" (aka slightly-less-deadly) coal technologies. "Clean-coal technology should be part of [the] mix... We are the Saudi Arabia of coal." "At the University of Wyoming in Laramie, thousands of people braved icy winds and waited in long lines outside a campus arena to hear the former president speak. He answered with a speech that held them rapt even as he ranged from his wife's plans for universal health care to her plans for creating a technology that could burn Wyoming coal without generating greenhouse gases." The short answer though, is that as long as you need dig coal out of the ground, it'll never be clean - particularly while coal companies employ the extremely destructive process of mountain-top removal strip mining to supply those "clean" coal plants with fuel. Slightly-less-deadly, sure, but "clean?" Don't try to shovel me that! As Jeff Biggers, the author of The United States of Appalachia: How Southern Mountaineers Brought Independence, Culture and Enlightenment to America, writes: "Clean coal: Never was there an oxymoron more insidious, or more dangerous to our public health." Barak Obama has at least spoken publicly against mountaintop removal and strip-mining in both DC and Kentucky. "We're tearing up the Appalachian Mountains because of our dependence on fossil fuels," Obama said at a campaign stop in Lexington Kentucky, sparking loud applause. As of yet, the Clinton campaign has been silent on the practice of mountain top removal or strip mining. Any energy plan that pledges to clean up coal must address both the combustion and extraction of the dirty fuel. I sincerely hope that a President Obama will fight to end the practice of mountain top removal, which devastates both the environment and the lives of Appalachia. I also hope that Clinton's silence on the matter is merely oversight. Neither candidate has yet convinced me that they their "clean" energy plans will not push an expansion of coal-fired power plants under the guise of "clean" coal that will accelerate mountain top coal mining and other strip mining and lead to expanded environmental and human devastation. My question is this: what exactly do Obama and Clinton mean when they say "clean" coal? If this is what they have in mind (or what they are ignoring), then they can take their "clean" coal and shovel it! Moser Baer PV steps up its plans to change the way India receives electricity. The company, a relatively new entrant in the solar photovoltaic (PV) market, has recently announced a series of new initiatives. These include setting up India’s largest grid-connected solar farm in the sunshine abundant state of Rajasthan, and increasing production capacities. MBPV announced that it had partnered with the Rajasthan Renewable Energy Corporation (RREC) to set up a solar farm of 1-5 MW capacity in the state. At US $4.5 million per MW, the total investment for this farm will be US $25 million. The company is awaiting the announcement of suitable tariffs for its sale of electricity to the state utility. It has other initiatives currently in the discussion phases with other states and investors. “In fact, there is so much interest today from potential investors in solar farms that we are tying them in MOUs that our module capacities and order books are properly planned out,” Khanna said. India’s economy is growing fast, nearing a double-digit growth rate. To fuel this growth, more commercial-use electricity is needed in addition to meeting residential demand. India has supply shortages in both residential and commercial electricity, including peak time supply. Solar electricity may help fill this demand gap, especially in peak time demand. Many of India’s remote villages are not connected with electricity grid, and solar offers a solution for this, along with other local small scale renewable electricity generation technologies. The government of India has announced subsidy plans of US $750/KW for installed capacity of residential or commercial use, with a maximum of US $1,250/household. For community and institutional use the subsidy is higher, at US $1,250/KW. The government has also announced feed-in-tariffs of up to US $0.30 per unit (KWh). This is up to 75% of the generation costs of PV, which range between US $0.38 to $0.75 per unit. India has abundant solar resources, receiving about 3000 hours of sunshine every year, and has a potential of about 20 MW per sq km, according to energy researcher Mr. Shirish Garud at The Energy and Resources Institute (TERI) in New Delhi. However, the high price of PV electricity remains an issue. With higher volumes and economies of scale the prices are expected to come down as the market expands in the next few years. “We expect the per unit price to drop to US $0.12 to $0.15 in the next 3 years. Also, as we have big plans for thin films as well, we don’t expect any delays in this target at least for Moser Baer. We also have a considerable focus on reducing BOS (Invertors, Structures, etc.) parts cost which will help us achieve our target,” said Moser Baer’s Khanna. PV-based electricity is expected to remain a very small share of total electricity generated in India in the near future. Therefore, even with higher costs it is not expected to add much to the averaged price of electricity. “It may add only about US 1/40 cent to averaged cost of electricity in the short-term. It is important that we invest in solar now, and the costs will come down as the technology and market develops in the future. It is very good option to develop for the future,” Garud said. Moser Baer PV is fueled by the enthusiasm for PV. It is planning to expand its plant in NOIDA near New Delhi, and planning a new plant near Chennai. The major expansion will be in thin-film capacity going from the present 40 MW to 600 MW by 2010, with a total investment of US $1.5 billion. An immediate doubling of crystalline silicon cell capacity from 40 MW to 80 MW is expected by the end of March 2008. The company has also invested in solar technology R&D through stakes in three U.S.-based companies: Stion, Solaria and SolFocus. MBPV hopes to benefit from R&D by these firms in concentration technology and nanotechnology to increase PV output and reduce the of size of PV producing units. The growing global market for PV, which is expected to generate revenues of up to 16 billion by 2012 by some estimates, is what MBPV is banking on. Most of the demand for MBPV is expected to come from the U.S. and the EU but MBPV’s expectations for Indian market are also high, 1,000-2,000 MW by 2010. With the flexibility of PV in generating electricity from milliwatt to megawatt it offers a wide range of applications. Moser Baer PV focuses primarily on large scale modules and commercial applications. However, solar lamps and other consumer applications of PV are a large potential market in India, especially in underpowered rural areas and high-tech uses like personal and business computing. In another big victory in the fight against the coal rush, the feds apparently suspended a major loan program that provided rural electric cooperatives with subsidized loans to construct new coal-fired power plants. An official with the US Department of Agriculture's Rural Utilities Service (RUS), which manages the loan program, cited the uncertainties of climate change and rising construction costs as the reasons for the programs suspension. "This is a big decision. It says new coal plants can't go to the federal government for money at least for the next couple years, and these are critical times for companies to get these plants built," said Abigail Dillen with the environmental law group Earthjustice. Earthjustice, the Sierra Club, the Montana Environmental Information Center and other environmental groups filed suits to block RUS financing for new coal-fired power plants last summer, arguing that RUS did not consider the impact of greenhouse gas emissions spewing from the pulverized coal plants the program is financing and the impact those emissions will have on global warming. The program's suspension marks the end of a reliable source of financing for new coal plants. The RUS program, established in 1935 as a New Deal-era program to finance rural electrification, has been a major funding source for the coal rush. The Seattle Times reported last May that "The beneficiaries of the government's largesse — the nation's rural electric cooperatives — plan to spend $35 billion to build conventional coal plants over the next 10 years, enough to offset all state and federal efforts to reduce U.S. greenhouse-gas emissions over that time." The RUS program provided $1.3 billion in loans to build new coal plants since 2001, according to the Minneapolis Star-Tribune. The suspension of the subsidized loan program means that no loans will be issued to rural electric cooperatives this year and likely none in 2009, James Newby, assistant administrator for the Rural Utilities Service, a branch of the Department of Agriculture, said Tuesday. According to the Star-Tribune, at least four utilities are currently lined up for RUS loans totaling $1.3 billion — for coal-fired power plants in Kentucky, Illinois, Arkansas and Missouri. Another project in Montana was denied funding last month and two more recently withdrew their requests for RUS loans: last October in Wyoming and earlier this week in Missouri. All seven plants will now have to look for private financing to move forward, and at least two of the plants are suspending development after this announcement. "This decision means one more nail in the coffin of new coal plants," said Alice McKeown, coal analyst for the Sierra Club. "There have already been a handful of plants affected by this news, including the indefinite delay of a plant in Missouri." Associated Electric Cooperative Inc. announced this week it was "delaying indefinitely" its proposed plant in Norborne, Mo., after receiving word of the loan program suspension. At least one developer, the East Kentucky Power Cooperative, is hoping to wait out the suspension of the loan program rather than seek more expensive loans on the open market, spokesman Nick Comer said. Other projects, like the embattled Highwood Generating Station proposed by Southern Montana Electric, Basin Electric Power Cooperative's Dry Fork plant in Wyoming, and East Texas Power Cooperative's proposed plant in Plum Point, Arkansas, must now try to secure private funding - a difficult task given the typically poor credit ratings of rural cooperatives and increased scrutiny of coal investments from Wall Street. "The move by RUS to take a time out on coal is part of a larger story," says McKeown. "We're seeing different sectors coming together to make sure that we are looking before we leap into 50+ years of serious global warming pollution. From carbon principles out of Wall Street to ending taxpayer subsidies, financial uncertainties are turning up the heat on energy investors to look to solutions rather than following a business as usual mentality." The suspension of the loan program is only temporary, but should hold at least through the end of 2009. It comes at a critical time in the coal rush and again signals growing (and appropriate) nervousness about new coal investments in the financial sector. Gaz de France has just signed the acquisition of Nass & Wind Technologie, specialised in developing, building and operating land-based wind farms in France. Founded in 2001, Nass & Wind Technologie, a subsidiary of the Nass & Wind Group, is an electricity producer that develops wind farms on its own behalf and for third-parties in France, and anchored in Brittany. Nass & Wind Technologie operates installed capacity of 34 MW. The company received all the necessary construction permits for 150 MW in the short term and owns a project pipeline totalling approximately 1 500 MW. This acquisition is fully in step with the Group's strategy in electricity production generated from renewable energies, in particular wind energy. Gaz de France already owns the largest wind farm assets in France, with installed capacity of almost 145 MW at the beginning of 2008. In light of the acquisitions carried out over the last few months, Gaz de France has decided to focus and rationalise the stakes it holds by creating a subsidiary dedicated to renewable energies, which will be named "GDF Futures Energies". This company now encompasses all of the subsidiaries and shares owned by Gaz de France in the field of electricity generated from wind power: Maïa Eolis, Erelia, Eoliennes de la Haute-Lys and soon Nass & Wind Technologie. Good Energies, a leading global investor in the renewable energy and energy efficiency industry, topped New Energy Finance's ranking of venture capital investors by number of deals in 2007, according to a report just released by the research firm. Good Energies claimed the top spot with 20 publicly announced investments into 19 companies in different sectors and stages of development worldwide. The total value of its publicly announced investments was $100.6 million. Good Energies' investments included solar PV manufacturer Konarka Technologies, wind power developers Everpower Renewables and Sequoia Energy, among other notable investments. Richard L. Kauffman, Chief Executive Officer of Good Energies, said: "We are focused on renewable energy. It is all we do. We have increased our financial commitment in the last year because we have seen opportunities to advance our mission of sponsoring leading companies and projects that will make a measurable difference in energy transition to a lower carbon world." Good Energies' investments in 2007 also included environmental forecaster 3TIER, smart glass technology manufacturer SAGE Electrochromics and Solarcentury, the U.K.'s leading solar energy provider. According to New Energy Finance, investment in clean energy companies by private equity and venture capital firms grew by 34% to $9.8 billion in 2007. The research firm believes this growth was fueled by successful investor exits from previous investments, improved industry knowledge, and increased competition for commercialization-ready opportunities. New Energy Finance is the world's leading independent provider of research to investors in renewable energy, biofuels, low-carbon technologies and the carbon markets. 2007 was the third year New Energy Finance produced its league tables, with record cooperation and disclosure from those in the industry. The result, the organization believes, is a robust data set on which to base the rankings. Green 2020, a specialist environmental software consultancy has announced today that it has partnered with ProcServe, a leading provider of procurement and marketplace connectivity solutions, to drive lower emissions in procurement processes for customers and their suppliers. Green 2020, a specialist supply chain environmental software company, provides expertise in the development of environmental policy, environmental management systems, carbon management systems, energy monitoring and carbon foot print assessments. Green 2020's expertise is in the reduction of carbon emissions and is working with ProcServe to help measure and improve the environmental performance of both buyers and suppliers. As an added value service to ProcServe's procurement service Green 2020 are providing solutions to help buy side and supply side organisations reduce energy use, measure and reduce carbon emissions and ultimately to save money. Philip Emsley, Chief Operating Officer at Green 2020, commented "We are very excited to be working with ProcServe to be able to offer our environmental services to both buying and supplying organisations. The bringing together of an electronic Marketplace platform and an Environmental Performance Improvement service will be the first of its kind and will ensure that organisations both large and small are working together to lower their carbon footprints and improve their environmental performance"
Veera Johnson, CEO, ProcServe said "With ProcServe's growing presence on the global arena of Procurement based eCommerce, for us to be able to provide an environmental management service to our global customers and suppliers is not only a bonus but it is our responsibility to help make a significant contribution to the Climate Change agenda. A purchasing decision is the first stage of the carbon emission lifecycle and if we can encourage our clients to purchase with and from suppliers with minimal environmental impact then we will be making a significant contribution to help reduce global emissions". What is the Outlook for the Availability of Fossil Fuels? I think this article is comparable to the people who slow down on the highway to look at an automobile accident. You are not involved in the accident, yet you surely are curious about what is happening. At the present time we can sense the presence of a disaster, but we do not have enough information to feel that we can get involved. My push to adopt renewable energies is based on our continued polluting of the environment with the burning of fossil fuels. We know that we must slow down this pollution so that our quality of life will not be severely degraded. There is another piece of information needed to prod us into action, and that is how long do we have before we run out of fossil fuels? As a current member of the earth, I am concerned that we leave future generation’s sufficient energy to bridge the gap from fossil to renewable fuels. This, to me, is looking at the car wreck. How long do we have until we are the ones involved in the wreck? The majority of Americans now think that climate change is a problem and that global warming is real. But there still is not a sense of urgency. Every year the US emits CO2 that equals the equivalent weight of 1.2 billion elephants (2 trillion pounds using average size elephants). It is time to stop ignoring 1.2 billion elephants in the room. It is time to implement a plan that will adopt renewable energies at a pace to stabilize the environment from CO2 pollution and then, hopefully, start to reduce the amount of pollution we must derive this plan with an eye to how long our reserves of fossil fuels will last. Once we derive this plan we then can look at future generations and inform them “Here is the plan”. The development of modern civilization has been dependent on both the availability and the advancement of energy. We have witnessed a progression from animal and steam power to the internal combustion engine and electricity generation and to the harnessing of alternative sources of energy. Because of our reliance on energy sources, it is also important to understand the impact of energy use on the environment. All aspects of energy, the way it is produced, distributed, and consumed, can affect local, regional, and global environments through land use and degradation, air pollution and global climate change via greenhouse gas emissions. Over the foreseeable future, it is very likely that fossil fuels will remain our largest source of energy. However, fossil fuels are finite resources and there is concern not only about both domestic supply and U.S. reliance on foreign supplies but, also, with the increasing cost of these fuels. The research on the longevity of fossil fuels is an exciting adventure in itself. I will touch on some of the theories before I conclude this series of articles. Given the slack of a decade or two, the best summation of the longevity of fossil fuels is presented in “Wikipedia, Fossil fuel: Years of production left in the ground with the most optimistic reserve estimates (Oil & Gas Journal, World Oil)”. With the slack of plus or minus 10 years, most projections are consistent with the Wikipedia numbers. . The popular Hubert peak theory projects that for any given geographical area, from an individual oil-producing region to the planet as a whole, the rate of petroleum oil production tend to follow a bell-shaped curve. “Olduvai revisited 2008” from The Oil Drum blog is an amazing study. This theory was first laid out by Richard Duncan in1989 when he observed that world energy per capita had been declining for a decade. The Olduvai waveform for oil starts in 1950 which is consistent with the Wikipedia projections that the waveform will be completed by 2053. The energy consumption of a nation is proportional to its Gross National Product (GNP).i.e. (The higher the GNP of a nation, then the higher its consumption. ).To maintain our accustomed standard of living, we require the amount of energy that we are burning now to maintain our lifestyles. With the depletion of fossil fuels this will require renewable fuels to fill in the gap. How do we hammer this information into a plan? A roadmap needs to be derived that utilizes the adoption of solar, wind, geothermal and biomass energies into our energy consumptions needs. Technologies such as stuffing CO2 into caves should not be adopted until they are proven. A plan that incorporates renewable energies with fossils fuels usage would be more realistic for our country to follow. We must continue tax incentives for the renewable energy sectors to incubate their growth. Our House of Representatives in Congress has passed a bill to renew the energy tax incentives that are due to expire December 31, 2008. President Bush threatens to veto this bill because it taxes the Oil Industry $19 billion dollars from multi-billion dollar profits. The president’s premise is that the oil companies require these profits to continue exploration of new oil. Politics aside, we desperately need to find new sources of renewable energy. We need to demand that our local and national leaders produce renewable energy action plans. There are pockets of leadership like Arizona and California. This leadership needs to be at a national level to be successful for the USA. Once this is accomplished we will be well on our way for future generations. Saudi Arabia, the world's biggest oil exporter, plans to become an expert in another, cleaner field of energy by investing in solar power, the country's oil minister said in an interview released Sunday. "For a country like Saudi Arabia ... one of the most important sources of energy to look at and to develop is solar energy," Ali al-Nuaimi told French oil newsletter Petrostrategies. He added: "One of the research efforts that we are going to undertake is to see how we make Saudi Arabia a centre for solar energy research and hopefully over the next 30 to 50 years we will be a major megawatt exporter. "In the same way we are an oil exporter, we can also be an exporter of power." Saudi Arabia produces more than 10 million barrels of crude oil a day. Nuaimi said that Saudi Arabia was also set to invest in carbon capture and storage programmes to develop technology allowing carbon dioxide to be extracted from the atmosphere and stored underground. "There are a lot of countries that are willing to cooperate with us," he said. At a summit in Riyadh last November, Gulf OPEC members pledged 750 million dollars (500 million euros) to a new fund to tackle global warming through financing research for clean technologies, with the emphasis on carbon capture and storage. The Masdar Initiative, Abu Dhabi's investment in developing future energy solutions, was named the "Cleantech Leader of the Year" today at the Cleantech Forum's Cleantech Awards in San Francisco, California, USA. The prestigious recognition was bestowed on the initiative for contributing credibility and resources to the cleantech industry. Dr. Sultan Ahmed Al Jaber, CEO of Masdar, received the award on behalf of Masdar at the Cleantech Forum Gala Dinner, which was attended by more than 900 global leaders in clean technology. "Masdar is developing and investing in innovative solutions for the world's increasing demand for future energies," Dr. Al Jaber said. "We are honored by this gesture of trust and confidence, as success in the development of technologies in renewable and sustainable energies – a mission of the Masdar Initiative – will only come from true cooperation and collaboration with our peers in the industry." Launched in September 2006, Masdar has created a US$250 million Masdar Clean Tech Fund (CTF) in partnership with Credit Suisse, Siemens and Consensus Business Group of the UK. The fund is a diversified venture capital investment vehicle that will build a portfolio of clean technology companies. The CTF has concluded its first year with one of the strongest and most successful deal flows in the investment community. It deployed most of its capital in 2007, one year ahead of schedule, taking strategic equity stakes in companies, such as Solargenics, Segway, Halosource, Europlasma, Sulfurcell, Heliovolt, SIC Processing and EnerTech Capital. Earlier this month, Masdar broke ground on Masdar City, the world's first zero-carbon, zero-waste, car-free city, where all of its programmes will be centrally located. The 6.5-square kilometre district, growing eventually to 1,500 businesses and 50,000 residents, will be home to international business and top minds in the field of sustainable and alternative energy. Masdar is also investing in human capital by cultivating the scientific and human talent required for the new clean technology sector. It has established the Masdar Institute of Science and Technology (MIST), the Middle East's first graduate-level, research-driven scientific institution focused on energy and sustainability, in cooperation with the Massachusetts Institute of Technology. MIST also encompasses the Masdar Research Network (MRN), a network of universities across the world in conducting advanced research in energy and sustainability technologies. In this landmark report, Joel Makower and the editors of GreenBiz.com answer the question: How are U.S. businesses doing in their quest to be greener and more environmentally responsible? It introduces the GreenBiz Index, a set of 20 indicators of progress, tracking the resource use, emissions, and business practices of U.S. companies: carbon, materials, energy, and toxics intensity, clean-tech investments, e-waste recovery, paper use, employee commuting, and more. Carbon Science, Inc (Santa Barbara, CA) has developed a new, patent-pending technology to convert, on an industrial scale, the greenhouse gas CO2 into a useful product used in the manufacturing of many consumer products. CO2 is generally accepted as one of the key, causal agents in the phenomenon of "global warming". 25 billion metric tons of Carbon Dioxide, CO2 were released into the atmosphere in 2005. Approximately 1/3 of that was from the burning of coal to make electricity. CO2 emissions are generally acknowledged as a contributor to the phenomenon of global warming. Current strategies to deal with the problem include sequestering the gas in underground geological formations and the ocean floor. The long-term energy costs and viability of long-term sequestering are unknown. Carbon Sciences proposes a completely different approach to the problem of CO2 – transforming the gas into something useful with commercial value instead of burying it somewhere. The company has developed a technology that converts CO2 into a usable form of Calcium Carbonate, what the company calls GreenCarbonate. This product – made from ubiquitous CO2 – has extensive commercial uses, including agriculture, the manufacture of paper, coatings, plastics, glass, ceramics, chalk, dental care, cosmetic products, construction and architectural applications and as a natural buffer used in pollution filters. The GreenCarbonate process combines captured CO2 with readily available mineral feedstocks. Using a patent-pending technology, mineral feedstocks are transformed into GreenCarbonate, a highly stable and useful mineral carbonate product. The GreenCarbon process uses waste mineral products from coal mines and other mining operations, also know as tailings, as a feedstock for the transformation of CO2 into useful mineral carbonates. Through a proprietary cyclone and mill system, these particles are processed into extremely fine mineral particulates to maximize the available surface area for reacting with CO2. This method greatly reduces the energy needed to produce fine particulate minerals, which reduces the overall cost of this carbon dioxide transformation system.